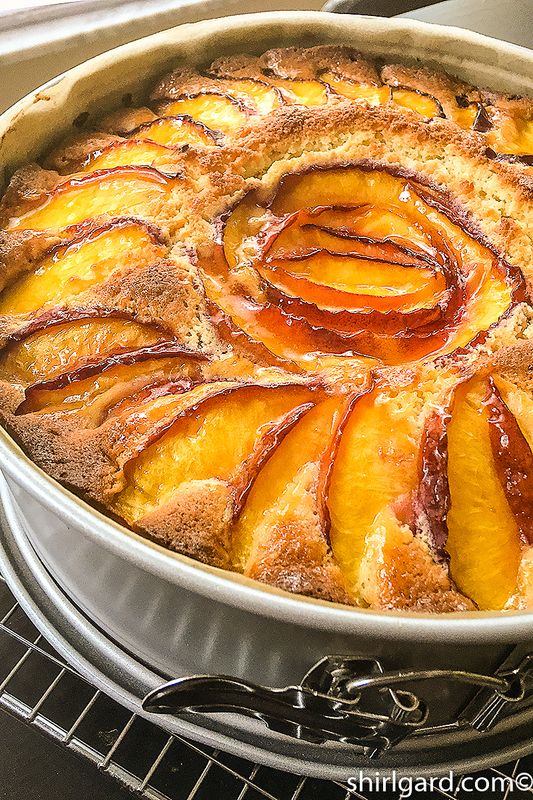 This recipe for Nectarine Almond Cake makes a moist cake underneath a colorful arrangement of sliced fruit baked on top. It is easy to make in two important ways. 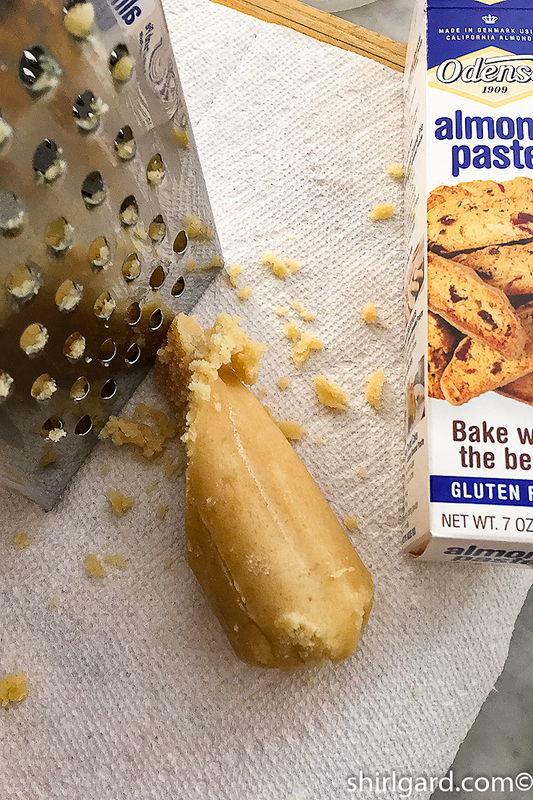 The cake batter, which uses almond paste, is easy because it can be made in a food processor. If you haven’t used almond paste before, make sure that it is processed with a little of the egg in the recipe until there are no lumps before adding any other ingredients, a step that ensures a smooth cake batter in the end. 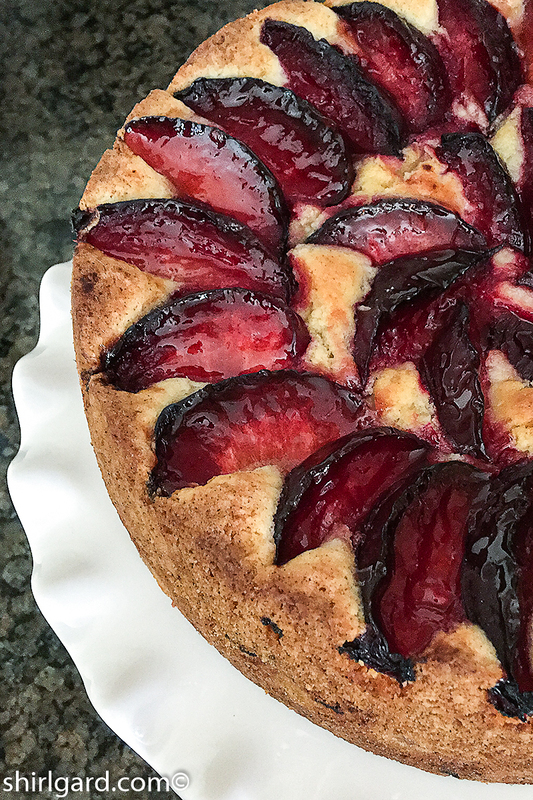 Using Nectarines—or Black Plums—also makes this cake easy because their skin is so tender there’s no need to peel them, making a quick job of slicing the fruit. As a bonus, neither one turns brown, maintaining their bright color. I prefer mixing this cake in a food processor, but if you don’t have one do it this way, following the same sequence as for a processor. Grating Almond Paste with a box grater. Mixing the cake with a mixer instead of a food processor. 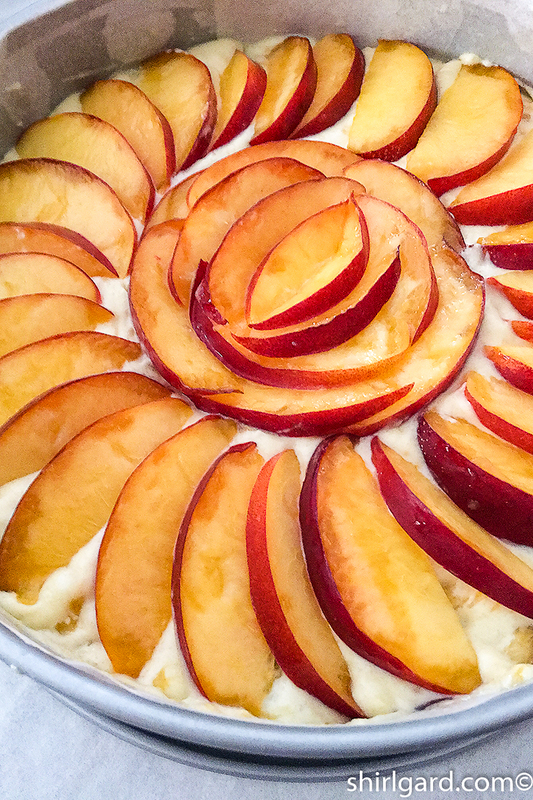 Nectarine Almond Cake just out of the oven. 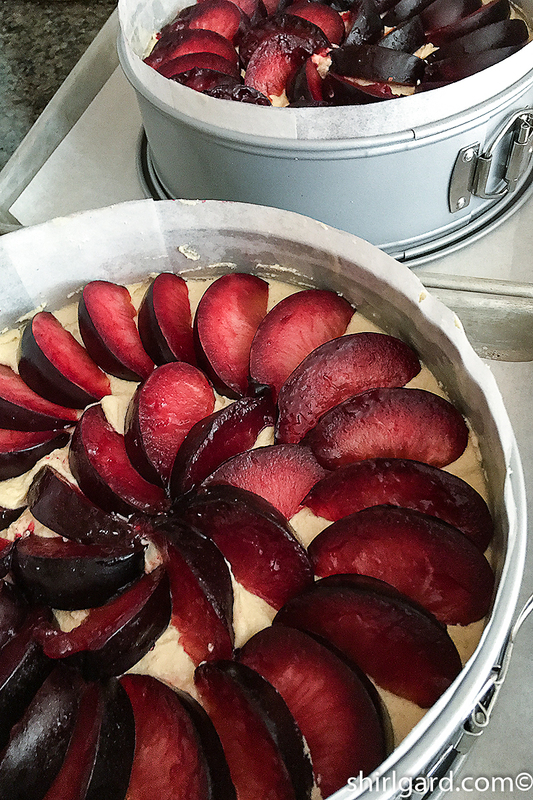 This is a versatile and easy-to-make Almond Cake, known as a Marzipan Kutchen in German. The sliced nectarines are very colorful on top of the cake and are easy to work with because they don't turn brown and have tender skins which require no peeling. 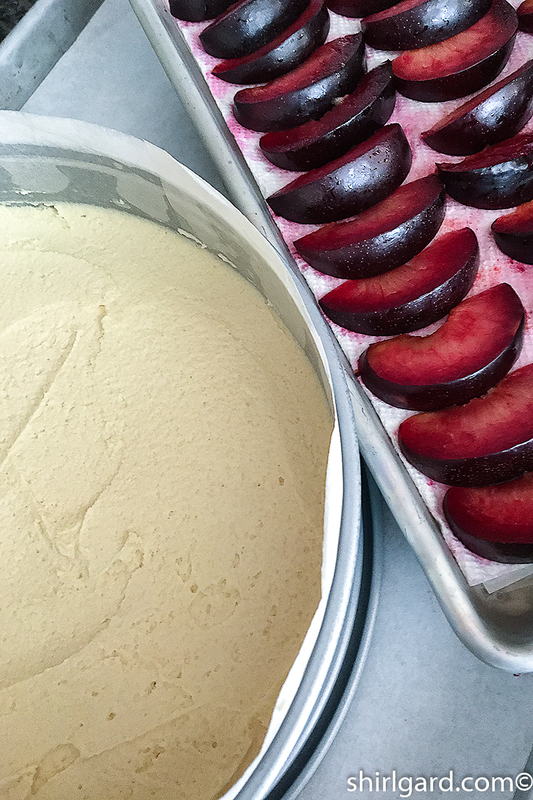 As a variation, I have chosen to pair it with Black Plums, which turn a rich purple color when they are baked. Either fruit works well. PREP PANS: Spray a 9" (23 cm) x 2½" (6.25 cm) springform pan lightly with non-stick spray (this will help keep the parchment lining in place. Line the bottom with a parchment round and the sides with a 3-inch wide parchment collar. 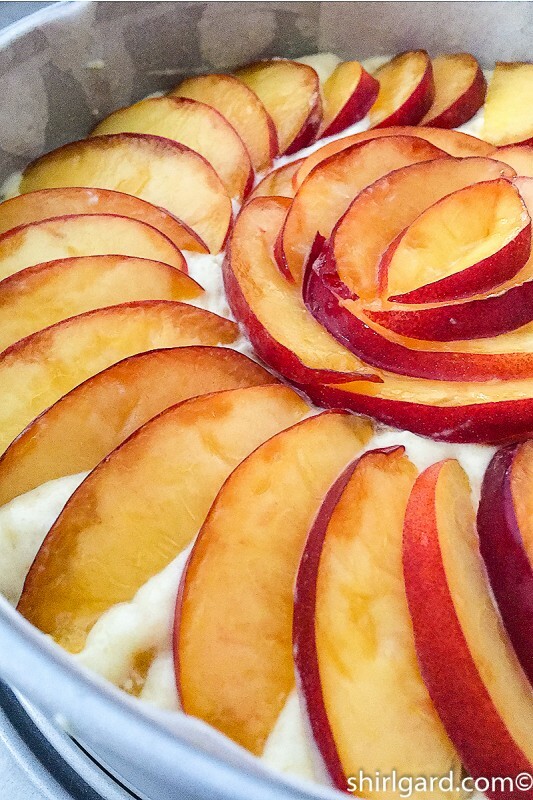 Place springform pan on a parchment-lined half sheet pan. PRE-HEAT OVEN: 350° F (175° C). 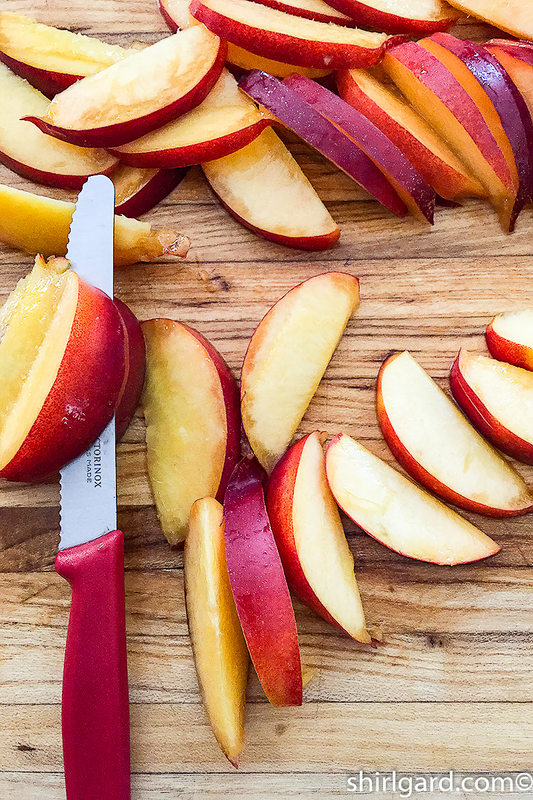 PREP THE FRUIT: Slice each nectarine in ½" (12mm) wedges, for arranging on top of the cake. 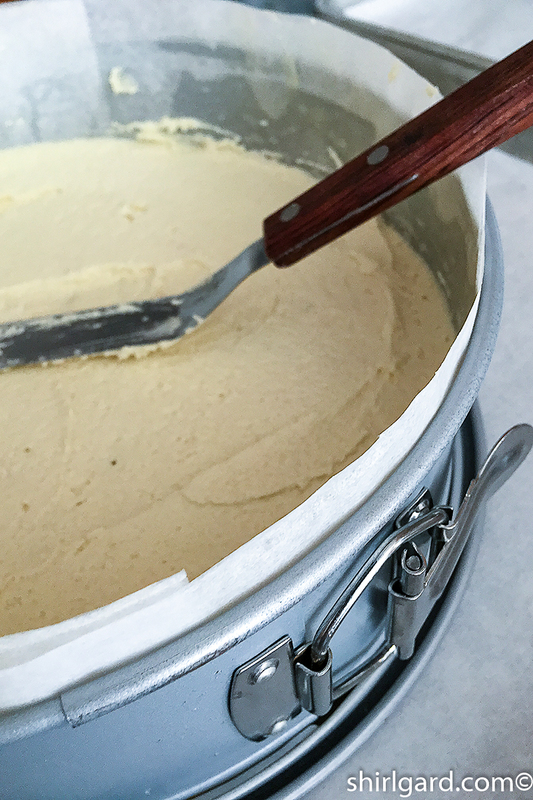 MIX BATTER: Cut the almond paste in chunks and place in food processor, along with a little bit of the beaten eggs. Process until smooth with no lumps. Add the rest of the eggs and pulse until completely incorporated. Add the melted butter and again mix until smooth. Beat in the sugar and almond extract until batter is smooth. Scrape down the sides of the bowl. WHISK flour, cornstarch, baking powder, and salt in a separate bowl. Add to the processor in three equal parts. 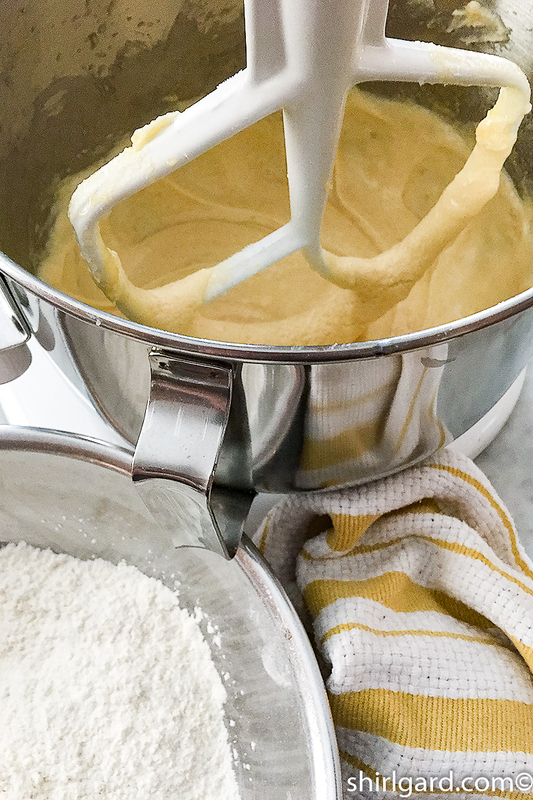 Continue mixing only until flour is fully incorporated and the batter is smooth. Scrape down sides of bowl and scrape up the bottom of the bowl. Mix another 30 seconds. SCRAPE batter into pan and spread evenly with an offset spatula. 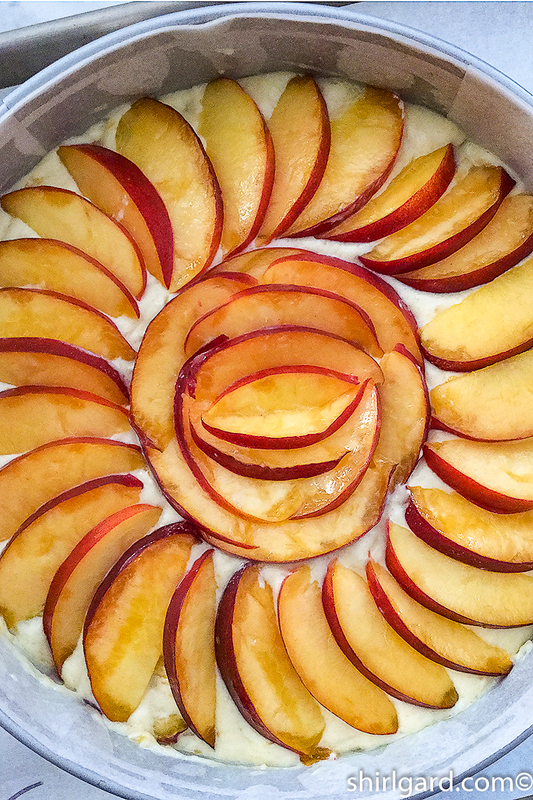 ARRANGE NECTARINE WEDGES in decorative circles on top of cake, covering the entire top of cake. BAKE for 30 minutes at 350° F (175° C). Turn oven down to 325° F (165° C) to finish baking, another 30-40 minutes. Total baking time 1 hour to 1 hour 10 minutes, until top is golden brown and a cake tester or wooden skewer tests clean. 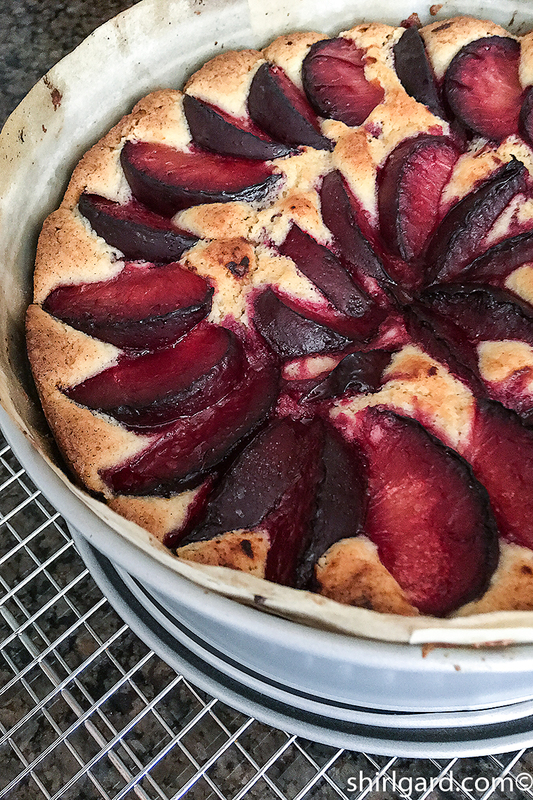 GLAZE the fruit with the apple jelly: When cake comes out of oven, melt the jelly with a little water by heating in a small sauce pan just to a boil. Brush hot glaze on just the fruit pieces on top of the cake. CONTINUE COOLING on the rack to room temperature. Remove the springform ring. 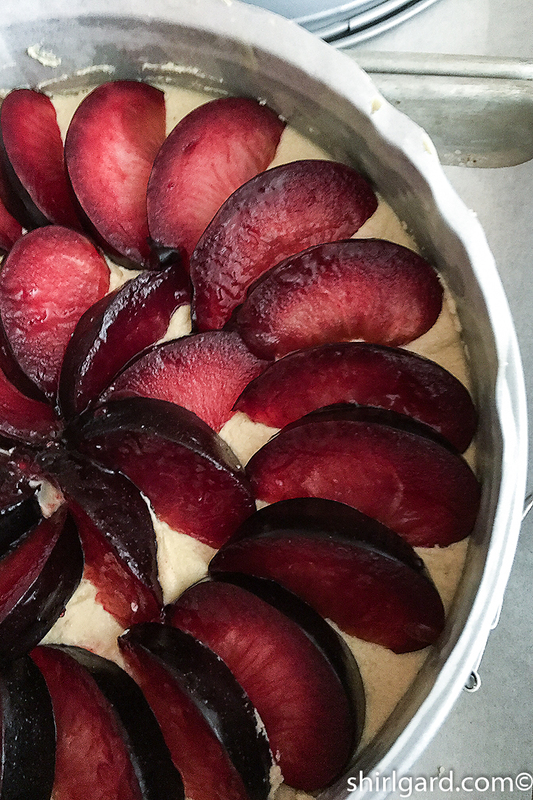 VARIATION: Almond Plum Cake - Substitute three large Black Plums (500g) and prepare the cake the same was as for Nectarines. 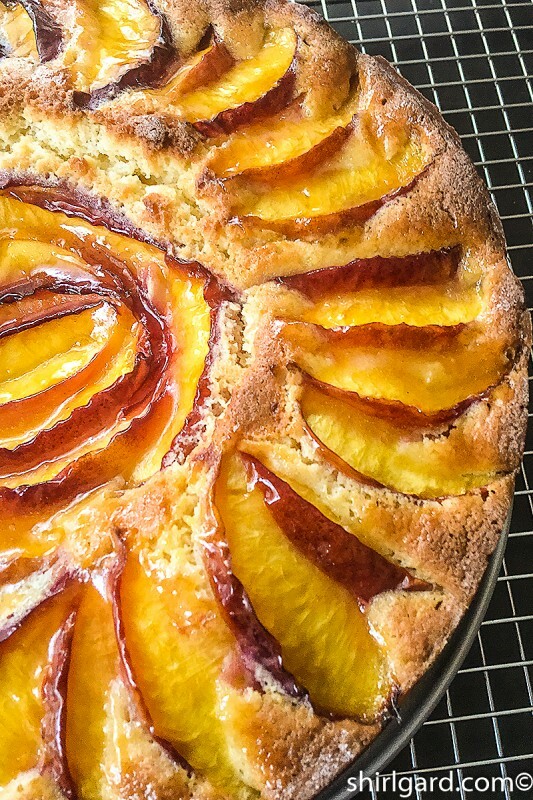 This cake was inspired by Apple-Almond Cake (Apfel-Marzipan-Kuchen) and the recipe adapted from Classic German Baking, a delicious book by Luisa Weiss (2016).